Austrian Airlines carried approimately. 12.9 million passengers in the period January to December 2017. This comprises a year-on-year increase of 12.8 percent or 1.5 million passengers. This rise can be primarily attributed to the airline’s expanded flight offering in Europe. The flight offering measured in available seat kilometers (ASK) was up 6.6 percent to more than 26 billion. Revenue passenger kilometers (RPK) climbed 7.6 percent from the prior-year level to surpass the level of 20 billion. Capacity utilization of the flights (passenger load factor) equaled 76.8 percent on average in 2017, an increase of 0.7 percentage points compared to 2016. On balance, Austria’s national carrier operated 143,999 flights in 2017, corresponding to an average of about 395 flights per day. “2017 was a record year for us. We achieved an all-time high with our passenger volume, which is unprecedented in the history of Austrian Airlines”, explains Austrian Airlines CCO Andreas Otto. “We will even further improve upon this passenger record in 2018 thanks to the additional Boeing 777 and the two new long-haul destinations Tokyo and Cape Town”, he adds. In the month of December 2017 Austrian Airlines carried more than 900,000 passengers. This comprises a rise of 11.7 percent from the previous year. The flight offering measured in available seat kilometers climbed 3.0 percent to more than 1.8 billion. Revenue passenger kilometers were up 5.8 percent to more than 1.3 billion. Capacity utilization (passenger load factor) equaled an average of 73.7 percent, representing an increase of 2.0 percentage points from December 2016. Austrian Airlines can look back at a successful year in 2017. Close to 12.9 million passengers flew with Austria’s red-white-red national carrier last year, comprising a rise of 12.8 percent compared to 2016. The airline plans another small expansion step in the current year, namely the integration of another long-haul aircraft, a Boeing 777-200 jet, in its fleet. The additional capacity will enable Austrian Airlines to expand its intercontinental route network. Starting May 15, 2018, the airline will resume flight service to Tokyo in Japan, and also plans to begin operating flights to Cape Town in South Africa as of October 27, 2018. “It is planned to hire 150 employees just to operate this one new aircraft”, explains Austrian Airlines CEO Kay Kratky. Austrian Airlines needs to expand its current staff by a total of 600 people this year due to the expansion of the medium-haul fleet in the past year as well as the planned transfer of pilots to the Lufthansa Group. “Austrian Airlines will continue to grow at the Vienna flight hub in spite of the current turbulences on our domestic market. We are currently looking for about 200 pilots, 300 flight attendants and 100 employees in the fields of aircraft maintenance and ground handling”, CEO Kratky states. The Boeing 777 will offer room for 306 seats, 24 of which are in the new Premium Economy Class. The new seats feature a greater reclining angle, more generous seat spacing and a broader seat service. This is complemented by a larger monitor for the on-demand entertainment compared to Economy Class as well as upgraded catering. Austrian Airlines employed 6,914 people as at December 31, 2017, a rise of 7.2 percent or 464 employees compared to the previous year. The fleet of consisted of 83 aircraft at the end of 2017, including 72 short-haul and medium-haul jets (Bombardier Dash 8-400, Embraer 195, Airbus 320F) and eleven long-haul aircraft (Boeing 767 and 777). The integration of the twelfth long-haul aircraft in the Austrian Airlines fleet is scheduled for May 2018. Copyright Photo: Austrian.com – my Austrian (Austrian Airlines) Boeing 777-2Z9 ER OE-LPD (msn 35960) (My Sound of Austria) VIE (Tony Storck). Image: 939151. 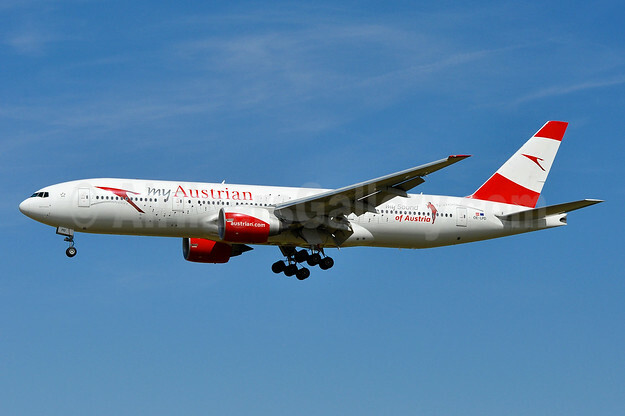 This entry was posted in Austrian Airlines and tagged Austrian Airlines, Austrian.com - my Austrian (Austrian Airlines), Boeing 777-2Z9 ER, msn 35960, My Sound of Austria, OE-LPD, VIE on January 11, 2018 by Bruce Drum.